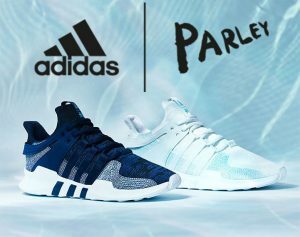 A while back I wrote an article about a collaboration between Adidas and Parley to create a shoe out of abandoned fishing nets appropriately named the Adidas Recycled Ocean Waste Shoe. 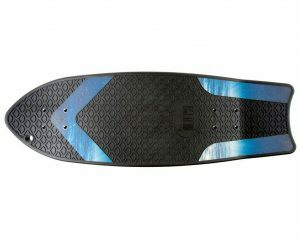 I was happy to see that this turned out to be more than just a concept and that you can actually purchase Adidas shoes made from recycled plastic. Even better, there have been an uprising of companies producing amazing products and fashion from plastics recycled from ocean trash. Every year, at least one million sea birds and 100,000 sharks, turtles, dolphins and whales die from eating plastic. Companies like Waste2Wear are producing company and school uniforms among other products from recycled plastics harvested from ocean trash. Materials like Bionic Yarn can now be found in well known designers from GStar Raw to Ralph Lauren. Designers like Stella McCartney are incorporating these new materials into their designs with sustainability in mind. And this could be a smart long-term play- with large-scale ocean cleanup programs coming to fruition, we may have a market flooded with post-consumer plastics collected from the ocean. These companies have perfected and in some cases pioneered fashion produced from fishing nets and ocean plastics. More than 100 containers in 30 ports of Spain collect plastic waste, abandoned nets, fishing lines, ropes and various trash from fisherman to the tune of 1 ton of waste per day. From this, the waste is sorted, cleaned, and processed into stylish eyeglass and sunglass frames. 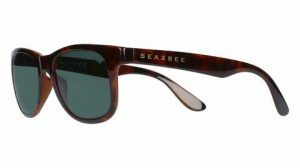 Beyond that, Sea2See is active in programs helping to clean up our oceans through education, action, charity, and political awareness. With a goal of creating a fully carbon neutral and fully recycled product, WearYourWaste uses a sustainable techno-fabric made with Econyl® – 100% regenerated polyamide fiber from post-consumer materials. 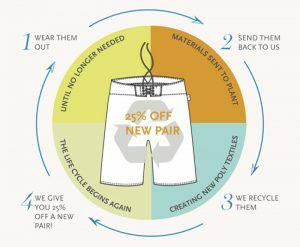 Although the swimwear isn’t 100% recycled (it’s blended with 22% Elastine), they are making use of a commercially available product and employing local techniques to reduce environmental footprints while making beautiful and durable swim pieces. Begining as a Kickstarter in 2009 by two friends, Riz’s aim was to create ‘The most beautiful and sustainable swim shorts in the world’. I believe they may have succeeded. Every pair of our shorts are crafted from Eco-Friendly 100% recycled and recyclable fabric as well as being digitally printed in the UK using earth-friendly inks. 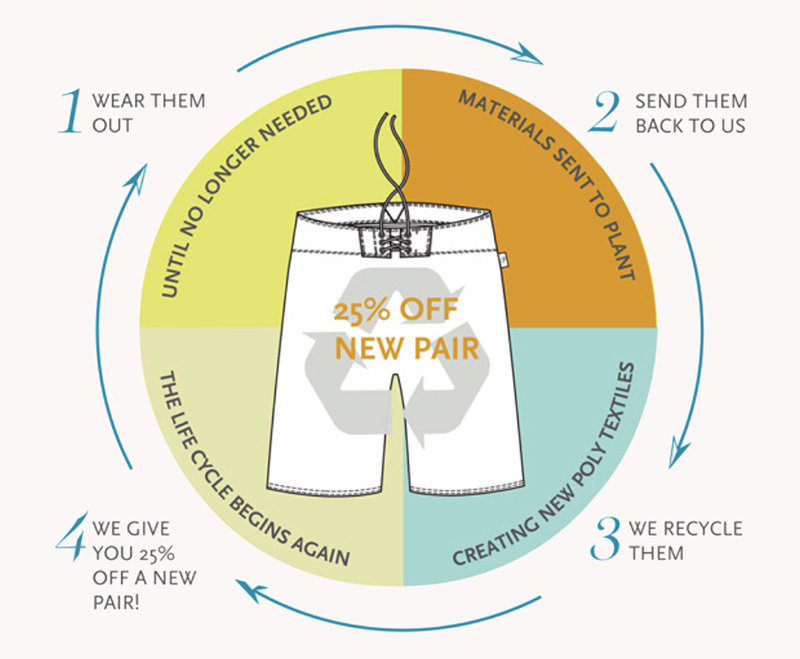 They have also come up with a ‘Rizcycle’ scheme which allows you to return your old shorts in return for a discount off your next pair; focusing the entire product life into a perpetual 360-degree process. Nets found along the coast of Chile (the long and narrow country stretching along South America’s western edge has more than 3,725 miles or 6,000km of Pacific Ocean coastline) are collected to make street-surfing skateboard decks, surfboard fins, and some other fun gear. Financial support is provided to local labor and participating communities, who are incentivized to keep plastic fishing nets out of our oceans. To date, their programs have recycled over 80,000KG of discarded materials. On average, 46,000 pieces of plastic are swirling in each square mile of our oceans. The project has expanded into a line of Adidas shoes, track suits, and shorts which you can purchase. All items are made with Parley Ocean Plastic™ yarn which is made from recycled waste, intercepted from beaches and coastal communities before it reaches the ocean. 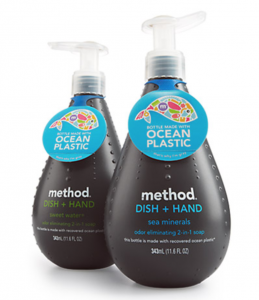 Not to be outdone by fashion companies, Method has incoperating recycled ocean trash plastic into their 2-in-1 dish hand soap product line. By partnering with beach cleanup groups, they have created a small-scale ocean plastic recovery chain to showcase how design can be used to tackle environmental problems and prove that there are alternatives to using virgin materials—like PCR plastic currently used in most bottle manufacturing today.